Mario Klingemann, a German artist who uses AI in his work, has radical views on creativity. “Humans are not original,” he says. “We only reinvent, make connections between things we have seen.” While humans can only build on what we have learned and what others have done before us, “machines can create from scratch”. It’s an interesting perspective. Setting aside whether or not human creativity is limited and indeed what precisely creativity is, it’s certainly true that artificial neural networks being developed today work out the rules as they go along, rather than being taught. AlphaGo, the AI that defeated the Korean go grandmaster Lee Sedol, was fed thousands of games, but no rules. It worked out how to play go entirely by itself. On 6 March, one of Klingemann’s works will go up for auction at Sotheby’s, giving it, and AI art, far more public recognition. The sale was arranged after a Sotheby’s scout discovered Klingemann’s art at an exhibition in Spain and thought it was exciting and ripe for auction. It’s not the first time AI art has been auctioned. A piece by the French collective Obvious was sold at Christie’s in October for an eyebrow-raising $432,500, 40 times the estimated price. Many people in the AI world were outraged, including Klingemann. Obvious were outsiders in the field. They used a straightforward application of an algorithm that has been available since 2015 and their pieces involved a large amount of human intervention – deciding when a portrait was finished and framing it like an Old Master. Klingemann, conversely, is recognised as a leading player. He has shown pieces at the Museum of Modern Art, the Metropolitan Museum of Art in New York and Paris’s Centre Pompidou, among other places. These include his Neurography series, “cameraless photography” using a computer to create fictitious photographic images, sometimes in videos spouting fake news. In 2018 he won a Lumen prize for his piece The Butcher’s Son, a set of Francis Bacon-like images. It was the first time the prize had been won by an AI-generated artwork. Klingemann’s art is more challenging than Obvious’s. The piece on auction is an installation, Memories of Passersby I, made up of a wooden console housing a computer and two screens that display an endless stream of surreal male and female faces, with one morphing into the next. There is no human curation. 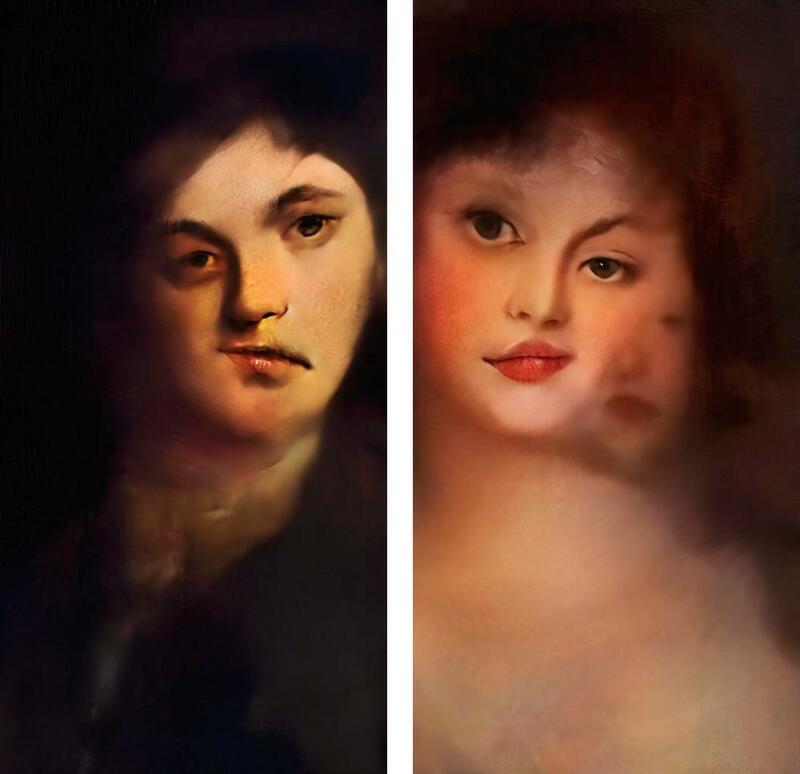 The machine creates, and no two portraits are ever the same. Sit and watch the machine and it almost seems to be thinking. The algorithm Klingemann uses is a spin-off of a class of AIs called generative adversarial networks (GANs). One goal of AI research is to develop autonomous machines that can create on their own initiative. An essential element is that they are able to assess their own work. A GAN does just this. It consists of not one, but two neural networks – the “brains” of the program. One generates a flow of images out of nothing and the other, which has been trained on specific images, accepts or rejects them. In this way, the generator learns and creates better and better work from scratch. Klingemann uses a variant of this called Pix2Pix. He feeds in a certain amount of material, leaving the machine enough slack to move beyond its programming, as he puts it; to “get creative”, unleashing it to do its own thing. He feeds in a blurry, nondescript image and the machine takes this unpromising material, picks out distinctive features, and shapes it into a human face, one that has not been programmed into it and has never existed before. But can machines really be creative? Can they be considered artists in their own right? If creativity is a defining characteristic of what it means to be human, how can a collection of wires and transistors be considered creative? Perhaps we’re not as different as we think. Ultimately, humans are mere biological machines, and conversely, a thinking, dreaming computer could be considered a silicon life-form. If we can be creative, why not computers? Computers may even become more creative than us, as Klingemann proposes. By trawling the web, they will have access, potentially, to all knowledge. Our human brains are too limited to imagine how powerful machine creativity may become. 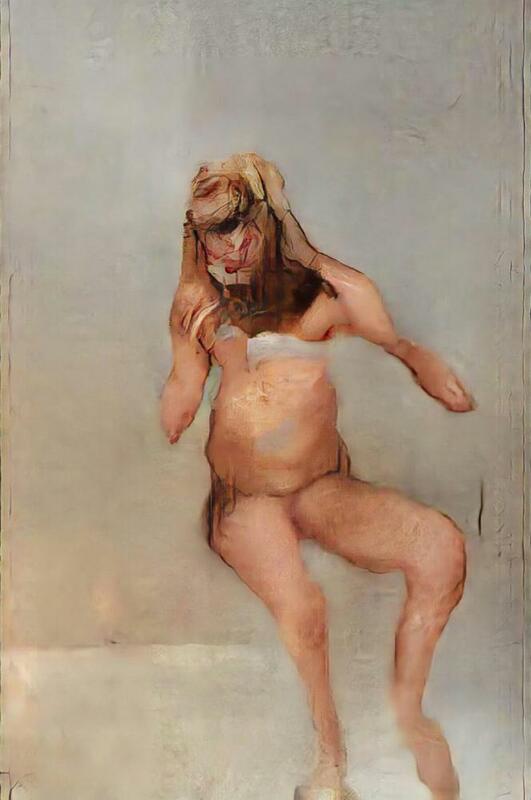 AI art raises a lot of questions. For a start, does it have more than novelty value? Ai-Da the Robot Artist was unveiled earlier this month to plenty of fanfare but little reference to the quality of the art it will produce. How are we to evaluate AI art? Should we apply the same criteria as for human art? At the moment all we can do is build machines that reproduce the way we think. We’re not capable of teaching them what we don’t ourselves know. But ultimately, we may build machines that can go beyond us, that are intelligent enough to create machines of their own, without human intervention. What is the use of all this research if its end is only to build machines that do no more than mirror our creativity? After all, Bach has already been done, by Bach. If, as Klingemann argues, machines can be truly creative while we are doomed only to build on what others have done, AI may ultimately liberate us. We can only expand on knowledge that has been passed down from previous generations. Machines may be able to dream up new realms of knowledge that we are simply incapable of producing, though we could appreciate it. “I hope machines will have a rather different sort of creativity and open up different doors,” Klingemann says. There are some who find the notion of creative machines deeply troubling, even offensive. In a recent article in the MIT Technology Review, the Harvard philosopher Sean Dorrance Kelly argued that creativity is one of the defining features of human beings and can only exist within a human context. This is surely short-sighted; there is no reason to claim that creativity belongs to humans alone. As Klingemann’s work demonstrates, today’s machines already show glimpses of creativity in art. AlphaGo, too, has shown unexpectedly creative behaviour in playing Go. To assert that machines will be eternally incapable of creativity for the simple reason that they are not human is a blinkered way of looking at progress, especially in a field that goes beyond science and technology and touches on our everyday lives. Machines are redefining what it is to be living, not merely human, beings. And in fact, little by little, we are merging with them – beginning with our smartphones, which have become extensions of ourselves. Two monumental acts of creativity kickstarted the 20th century. Einstein’s relativity theory and Picasso’s development of cubism led us to see the world in new and profoundly different ways and have led to world-changing scientific and artistic developments. Both arose from people seeing connections between fields that seemed to have nothing to do with each other. Einstein saw a link between the laws of thermodynamics – of the way heat flows – and the nature of space and time, while Picasso turned to developments in mathematics, science and technology to widen his artistic palette. Perhaps in the future, with their encyclopedic knowledge and lightning-fast processing powers, computers will begin to accomplish similar leaps of the imagination, first matching, then surpassing human creativity. Such leaps could have incalculable value for humankind, opening up new cultural and scientific avenues for us to explore, creating new forms of art, literature and music, aiding medical research, and suggesting ways of dealing with our failing climate and growing ecological crisis. Far from replacing us, they might enhance us, enabling humans and machines to work side by side at the highest levels of creativity.